Turkey is amassing a new set of fans each day — and with good reason. It’s a lean source of protein, low in fat, rich in nutrients such as selenium and phosphorus, and it boasts an assortment of the coveted B vitamins. Not to mention the fact that it’s downright tasty. Topping the list of turkey’s bragging rights is versatility. Consider turkey burgers alone. Check out the following recipes and see how well they pair with everything from guacamole to kimchi. From summer grilling to holiday feasts to school sandwiches, there’s more than one delicious reason to keep turkey in your daily, year-round diet rotation. 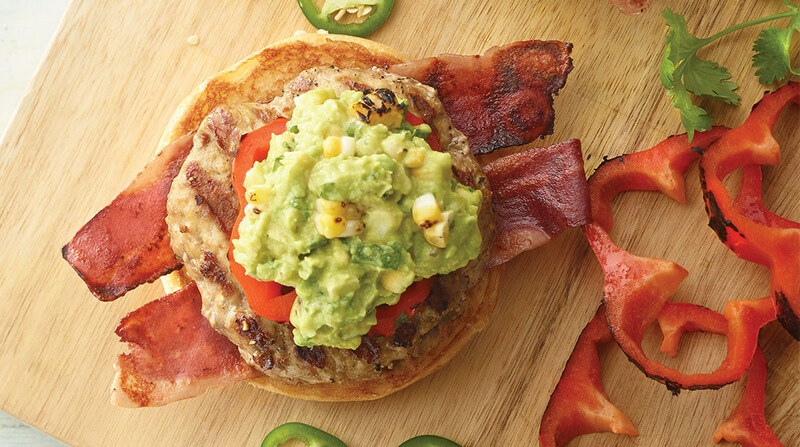 What makes a good grilled turkey burger even better? A great guacamole! This crowd pleaser is specially made with a charred ear of corn. It requires a little extra effort, but it’s worth it. Serve it up on brioche buns, and your guests will be kissing the cook long after the meal ends. Prepare grill for medium-high heat. Brush ear of corn with oil. Grill 5 minutes or until kernels are golden brown. Remove kernels from ear of corn with knife. In medium bowl, mash avocado with fork. Add corn, chili pepper, onion, lime juice and cilantro. Add salt and pepper, if desired. Gently stir to combine. Cook turkey burgers as specified on the package. Always cook to well-done, 165° F as measured by a meat thermometer. While burgers are cooking, place bacon slices on grill and cook until crisp. Always cook to well-done, 165° F as measured by a meat thermometer. Grill red bell peppers until slightly charred; slice. Place burger on bun bottom. Add peppers, bacon and corn guacamole mixture, then bun top. Skip the avocados, chili pepper, onion, lime juice and cilantro – pick up Wholly Guacamole® spicy guacamole. 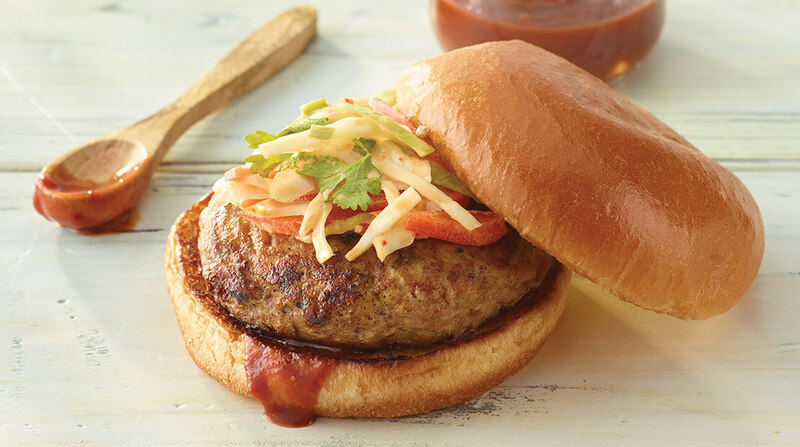 This juicy turkey burger is dipped in a Korean- style barbeque sauce, then topped off with a spicy kimchi slaw, all on a buttery brioche-style bun. You’ll definitely want to add this delight to your weeknight dinner menu! In small bowl, add garlic, ginger, sesame oil, soy sauce and barbeque sauce. Mix well; refrigerate. In medium bowl, combine cabbage, mayonnaise, honey, vinegar, kimchi, red pepper, carrot and green onion. Refrigerate. Cook turkey burgers as specified on the package. Always cook to well-done, 165° F as measured by a meat thermometer. Spread barbeque sauce on bottom bun. Add turkey burger and kimchi slaw, then bun top. 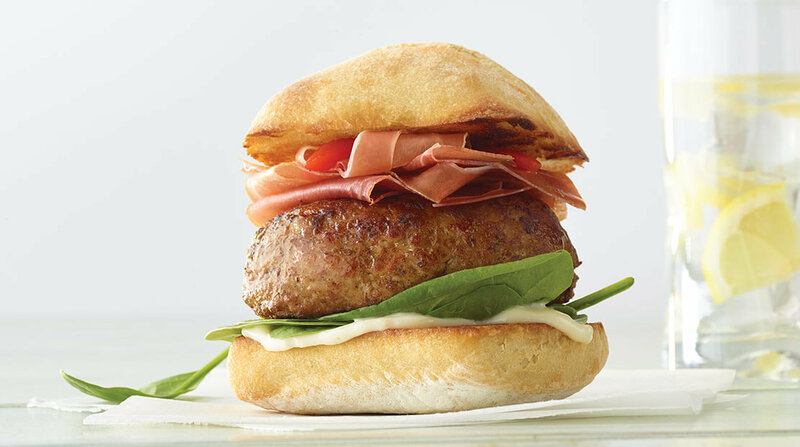 This tasty Italian burger recipe takes a lean turkey patty and dresses it up with garlic and lemon juice, tops it with veggies and prosciutto, and still manages to come in under 350 calories per serving. Classy! Cook turkey patties as specified on package. Always cook to well-done, 165° F as measured by a meat thermometer. In small bowl, whisk together mayonnaise, garlic and lemon juice. Spread on both sides of each roll. Place turkey patties on bottom halves of rolls. Top with baby spinach, prosciutto and red pepper. Cover with roll tops. 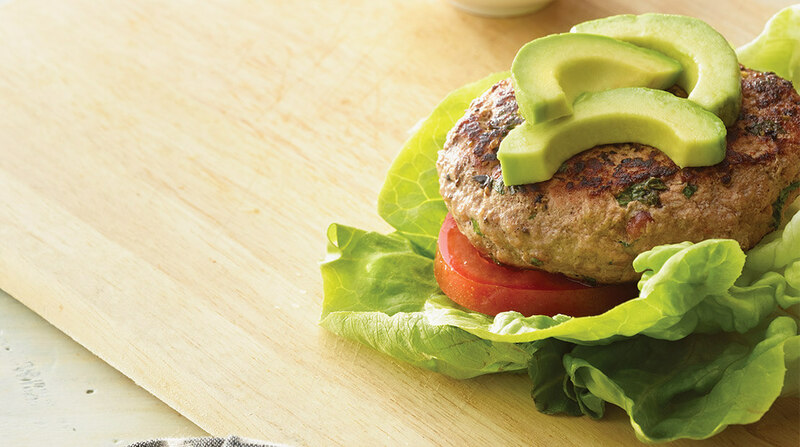 Lighten up your dinner with these creamy salsa turkey burgers wrapped in hearty lettuce leaves. Topped with delicious Greek yogurt sauce and avocado, this dish is sure to get rave reviews. And it’s ready in under 30 minutes. In medium mixing bowl, combine ground turkey, 1⁄2 cup of salsa, cumin, cilantro, breadcrumbs and olive oil. Add salt and pepper, if desired. Mix well and form into four patties, 1⁄2-inch thick. Spray skillet with nonstick cooking spray. Preheat skillet over medium-high heat. Add burger patties to hot skillet. Cook approximately 14-16 minutes, flipping three times. Always cook to well-done, 165° F as measured by a meat thermometer. In small mixing bowl, combine yogurt and reserved 1⁄2 cup salsa. Top lettuce leaves with tomato, avocado, turkey burger and creamy salsa. 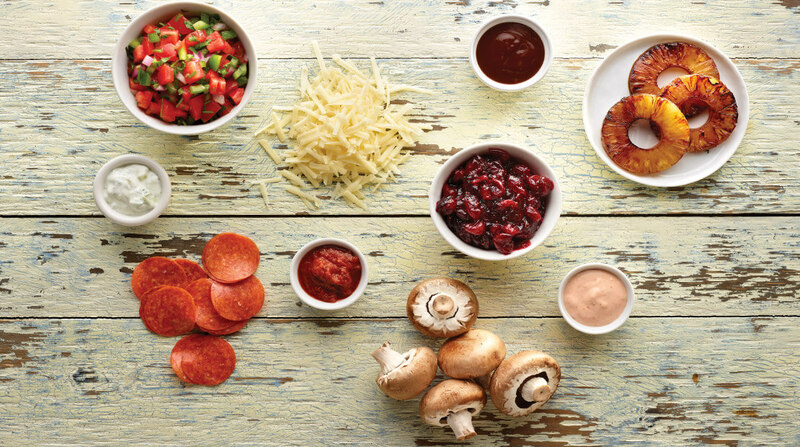 Here are other flavors that make stellar turkey burger toppings. Find all of these recipes and more at jennieo.com. Are your burgers sticking to the grill? Breaking apart when you flip them? The pros from Jennie-O Turkey Store are here to help. Lean meats are more likely to stick to the grill, so when you’re working with turkey patties, it’s especially important to make your grill nonstick. It only takes a minute! Here are a few tried-and-true tricks to keep your turkey burgers free and clear. 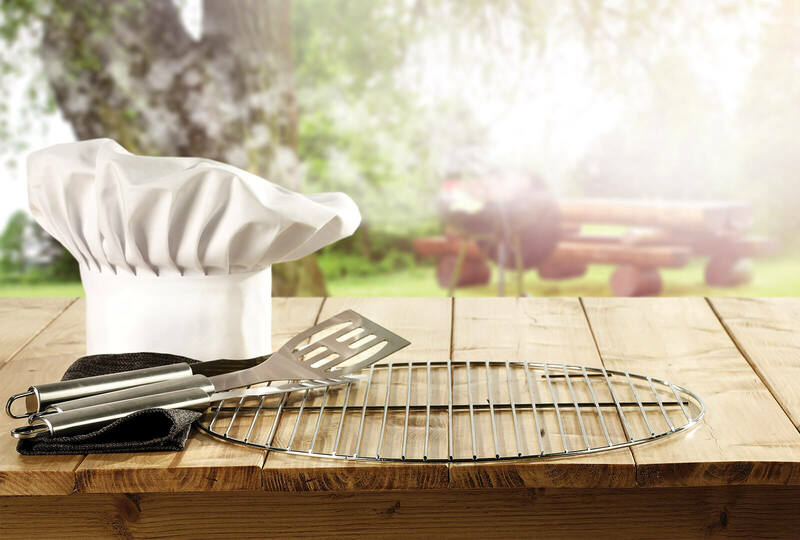 Apply a nonstick cooking spray to grill grates. Do this before turning on your grill. Spraying an already-lit grill causes flame surges. Season the grill grates with oil. Use a paper towel and tongs. You want the paper towel saturated with oil, but not dripping. Be careful, if oil drips on the hot grill, it can flame up. Use the tongs to drag the paper towel over the grill grates. Don’t flip the turkey burgers too early. A good sear will prevent sticking. Global View Where in the world is Jack Shao?